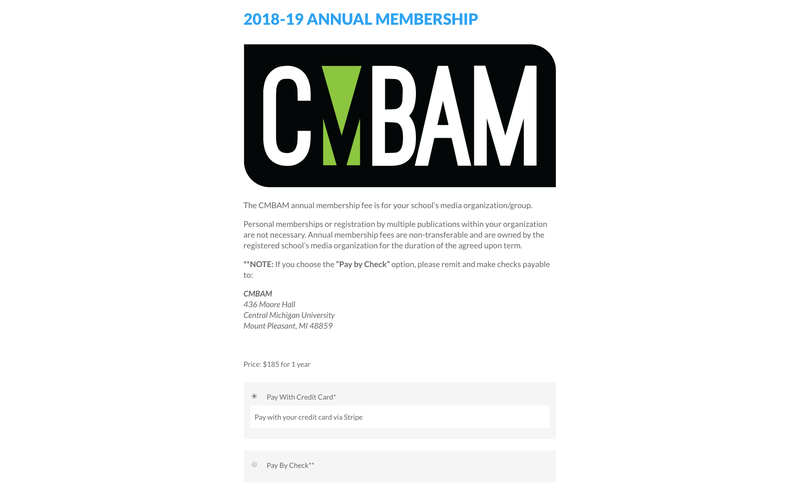 We’ve pulled together this CMBAM membership renewal walk-through guide to assist you when it’s time to purchase your ’18-’19 CMBAM Annual Membership. If you follow this step-by-step guide, you’ll be able to not only renew your membership but also update your member information, track subscriptions and see your payment history. 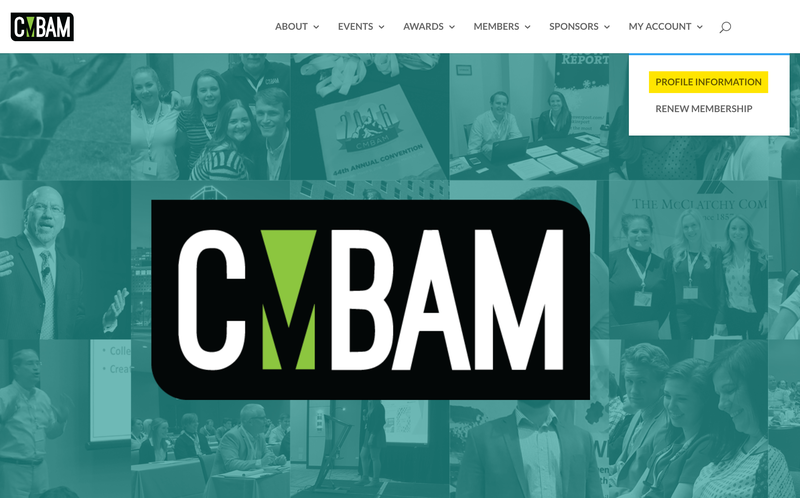 If you have any additional question about your membership status, please contact Kathy Ciesinski, VP of Membership at membership@cmbam.org. She’ll be happy to assist you. You will need to log into your current CMBAM.org account. 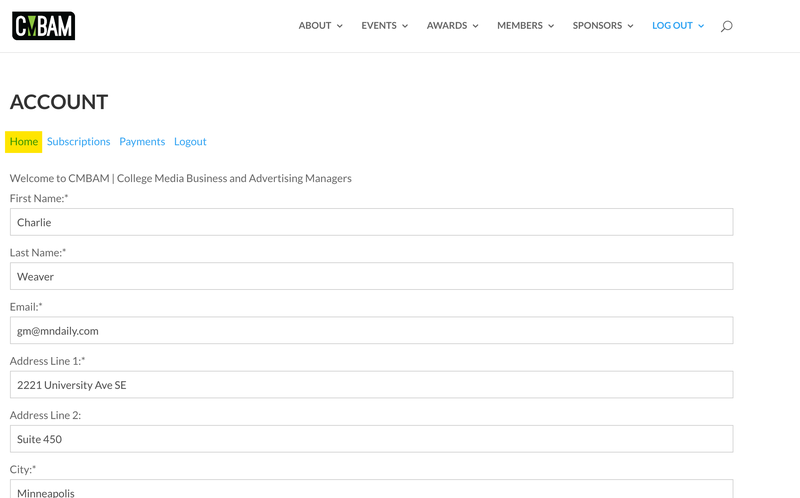 Once logged in, navigate to CMBAM.org and log into the website a “My Account” menu item will appear in the upper right-hand corner of the menu bar. Hover over the “My Account” menu item and navigate to the “Renew Membership” submenu item. Once you click on the “Renew Membership” menu item the payment page should appear. Decide which payment option you’d like to choose and fill out the appropriate information for a secure credit card payment or a mailed invoice. Note: If you choose the “Pay by Check” option, your membership will not officially be approved until the treasurer receives your payment. If you’d like to update any of your profile information you can again navigate to the “My Account” menu item. Hover over the “My Account” menu item and select the “Profile Information” drop-down. After clicking the “Profile Information” drop-down you’ll be taken to the “Account” homepage. It’s from this page that you’ll be able to see your detailed profile information as well as links to your subscription status and payment history pages. You can update any of your organizational information from this page and are encouraged to do so if any of this information has changed in the last year. PLEASE NOTE: If you update the contact information email address, this will ONLY affect where we send email notifications about your account. Changing this information will not update the login credentials for the site, and you’ll have to continue to use the original email address that was used to create the account. If you want to update login credentials, unfortunately, you will need to create a new account and fill out all of your organization information again as this will be a brand new account. To check on your subscription status, click on the “Subscriptions” link on the “Account” page. To check on your past payments, click on the “Payments” link on the “Account” page.